Singleseed Juniper 'Blue Star' (Juniperus squamata 'Blue Star'): growing, planting, caring. Juniperus squamata - the singleseed juniper - is native to mountainous areas from Afghanistan to China and Taiwan, growing variably in the wild, from prostrate ground cover to spreading shrub to upright shrub/small tree. It takes its specific epithet in reference to the scaly brown bark. 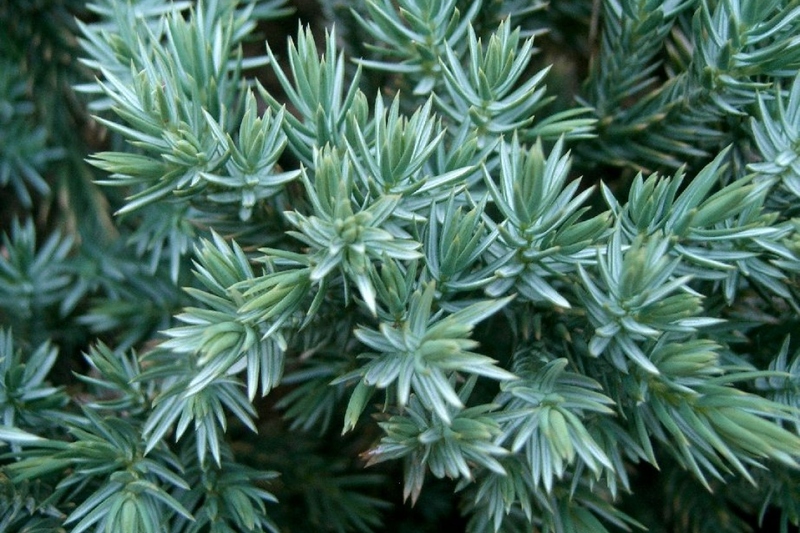 'Blue Star' is a slow-growing cultivar - a sport of Juniperus squamata 'Meyeri' - with a low-mounded, hemispherical habit, with an awl-shaped, silver blue foliage. It is commonly called singleseed juniper because each bluish, berry-like, female cone contains but a single seed. It grows in average, medium moisture soils in full sun, but adapts to a wide range of soils as long as it is well-drained, and performs particularly well in dryish, sandy soils. An outstanding dwarf juniper, perfect for growing in the rock garden or container. It forms a slightly rounded shape, with tightly packed, prickly, needle-like metallic steely blue foliage. In open soil, plant preferably in autumn, possibly in early spring, outside periods of frost. Find a sunny location in ordinary drained soil - even sandy or stony - neutral or alkaline. Make a hole 1/3 wider than the root ball, not mixing the soil layers. Soak the rootball if your juniper has waited long, then plant it without burying the root collar, which is the boundary between roots and branches, then water copiously. For large juniper trees, place a solid stake facing the prevailing winds with a flexible attachment. Mulch to avoid weeding. In pots, plant in a mixture of garden soil and sand, in a pot proportionate to the size of the adult plant. It can vary enormously; some dwarf junipers do not exceed 30 cm while others reach 15 meters. If you keep your juniper in pots, replace the topsoil with mature compost every 2 to 3 years. The pruning is useless on the juniper trees, and it is better to limit it. After two years, you can remove the stake - it is no longer necessary, but could hurt the bark in the long run. Renew mulching in the fall at the base of your juniper trees. A mulching made of wood is perfect.